Below are the top 7 plants that you will want to grow this year. Each one is unique and lovely. Plan on setting them up in garden pottery and you should have a magnificent yard or patio! Fuschia x hybrida - Nice ruffled petal swirl like a flamenco dancers skirt. Phormium Jubilee - It's leaves have cherry hued margins. x Heucherella Stoplight - Nearly glows in light shades. Echinacea Purpurea - Petals like royal feathers. Poodle Skirt Dahlia - Poufs and pets add pizazz in hot pink. Superb Grevillea - Apricot orange flowers. Kalanchoe thyrsiflora - Looks like a deep sea creature. AWESOME! Make a succulent live bouquet. For a striking display, arrange echeveria rosettes in a elegant vase or garden planter with other eye catching succulents. Try the burgundy flowered scabiosa, blue viburnum berries, string of pearls, all pictured above. 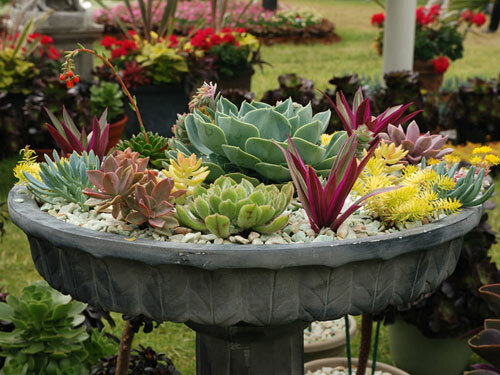 Afterward, set the rosettes into decorative containers filled with succulent mix to start new plants. Dividing succulents is easy, saves money and fun to do. Give it a go! Go wild with foliage. 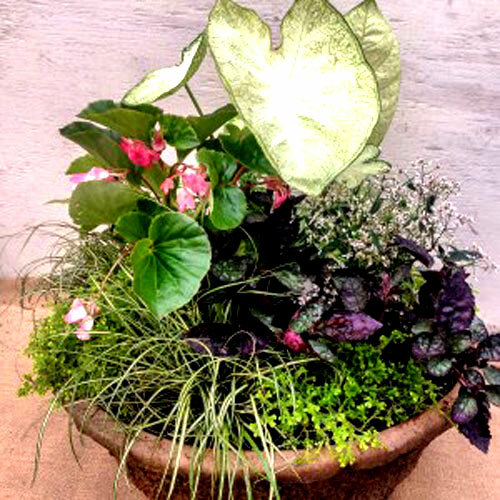 To make an all foliage garden planter like the one show here, combine plants of various leaf sizes, shapes, colors, and textures. In this Hawaiian garden, the smooth, coffee and apricot hued leaves of ti plant contrast with a blue fan palm's corrugated fronds and elephants ears wavy green leaves. Mounded red and green tillandsias add punch in the foreground. Your pots can be subdued and quite like the ones show or go with bold, bright ones to add to the foliage colors. Read more.....Do it yourself backyard serenity. Read more.....Sunflower seeds give energy.